San Rodrigo Aljojuca, District Chalicomula, 350-550 A.D. The Fine-Orange vessel has the form of a dog curled up in sleep. 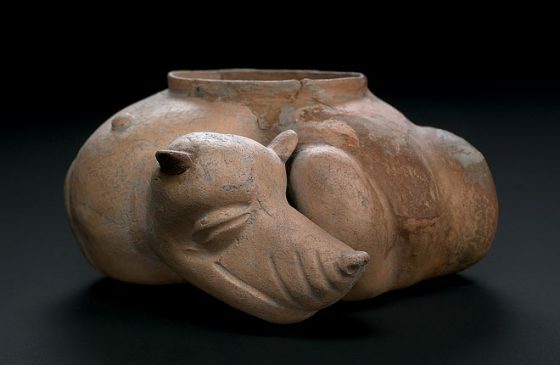 Short-legged, hairless dogs were at home in pre-Columbian Mexico and served as playmates, but were also fattened and eaten. Dogs were regarded as the deceased’s companions on their journey to the underworld, and so it is not surprising that figures of dogs were found in burial sites. 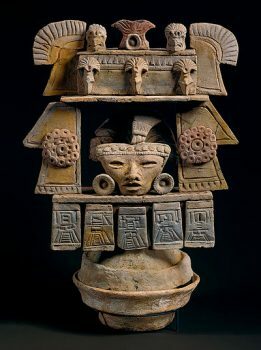 The naturalistic treatment of dogs is one of the most frequent depictions in ceramic art, especially in western Mexico. The incense burner consists of a basin and an upper part on whose reverse side a “chimney” was mounted as a smoke outlet and whose front side takes the form of a temple (or stage) adorned with birds’ heads, feathers, and rosettes of clay, as well as small plaques into which, in turn, depictions of temples have been scratched. The center is a typical, “triangular” Teotihuacan face. Remnants of red, ochre, and blue painting give an inkling of the original coloration. Burning copal resin was a component of religious ceremonies.